So many couples have been able to find love on The Bachelor, The Bachelorette, and Bachelor in Paradise. Not all of these couples have been able to maintain that love after the show, but at least they had it while it lasted. 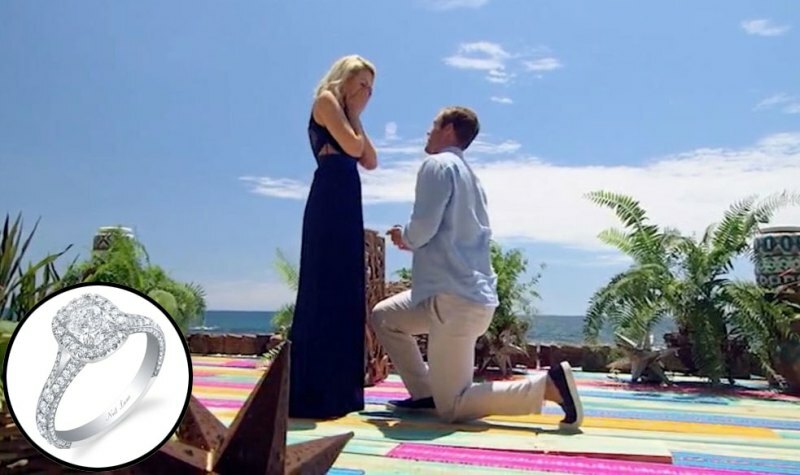 Anyone who watches The Bachelor and its spin-offs know that the ring is a huge deal. Ring designer Neil Lane makes an appearance, and we see soon to be engaged (or soon to be dumped) men pick out the perfect stone. Keep reading to see what they picked out. Which Bachelor ring was your favorite? Krystal was something of a villain on her season of The Bachelor, but everything changed when she showed up in Paradise. We got to see a more pleasant side of Krystal, and we even changed our minds about her now-fiancé, Goose, AKA Chris Randone. 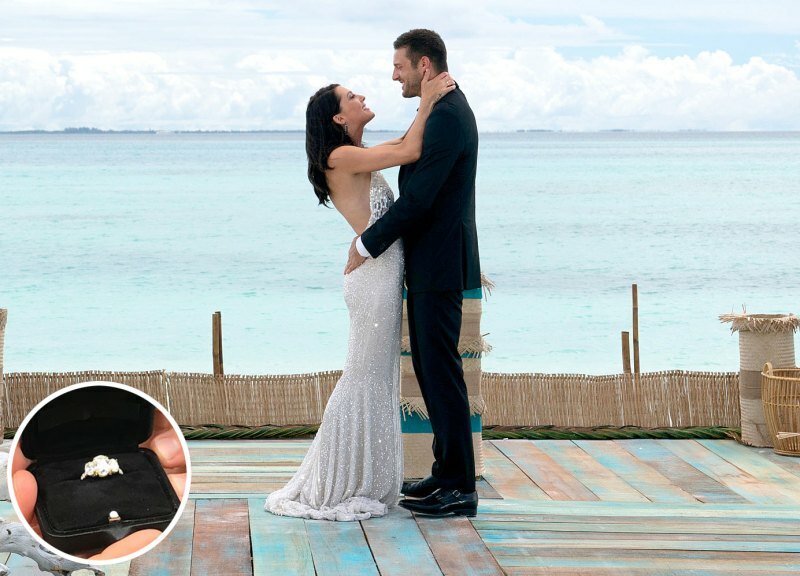 Randone proposed to Krystal on the season finale of Bachelor in Paradise with a pear-shaped diamond ring on a blinged-out platinum band. We’re definitely rooting for Glitter Goose. Male model Jordan Kimball fell head over heels for Jenna Cooper. He was certain from the moment he met her on Bachelor in Paradise that this was the woman he wanted to marry. He proposed to her on the show’s season finale with a 1.5 carat cushion cut diamond on a band studded with more than 158 tiny diamonds. It’s a ring that would make any girl swoon, and Jenna accepted the proposal. Unfortunately, Jenna wasn’t being entirely faithful (according to some texts that were leaked by a man outside of the Bachelor franchise). Becca finally got her happily ever after when her man, Garrett Yrigoyen got down on one knee and asked her to marry him. He proposed with an 18-karat yellow gold ring— an unsual colour choice as far as Bachelor rings go, but I’m not mad at it. The ring has three stones on it to represent the couples past, present, and future. The triple stone set-up might just be a nod to Meghan Markle’s famous engagement ring. We can’t talk about Becca without talking about the infamous Arie situation. 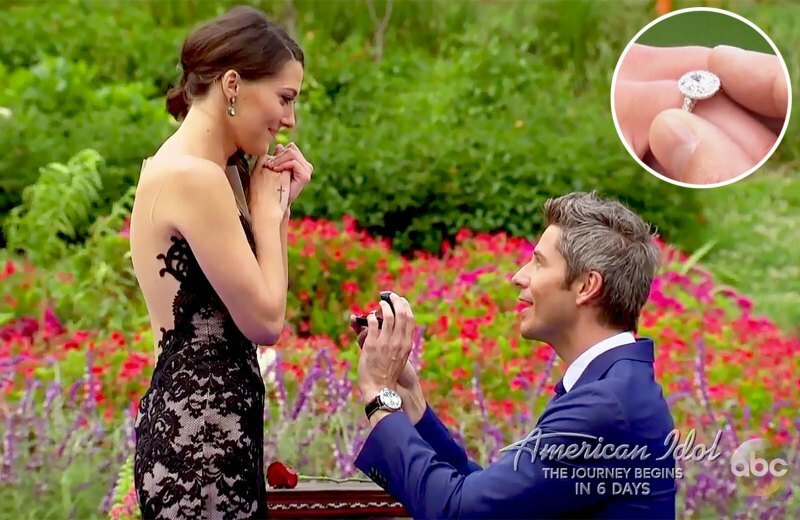 As we all know, Arie chose to propose to Becca on his season of The Bachelor, but then he changed his mind, broke up with her, and proposed to his now-wife Lauren on After the Final Rose. Now, this is a real throwback. We’re going back in time to look at the first ring ever presented to a lady in the history of The Bachelorette. Yes, there was a season of The Bachelor before Trista’s season, but this was the first time that a lady was calling the shots. This ring is pretty basic if you ask me. It looks like a 2003 ring, probably because it is a 2003 ring. Before Neil Lane was The Bachelor and The Bachelorette’s go-to jeweler, hopeful people looking for love proposed with rings from a variety of different designers. This ring that Ian gave to Meredith was supplied by Tacori. The cut and style of this ring is pretty similar to Trista’s ring. Again, it’s not a style that I particularly love, but to each their own, I guess. As long as it sparkles, that’s all that matters. In the end, this lovely couple didn’t really commit to an engagement, but Bob still wanted to mark the moment with a beautiful piece of jewelry. 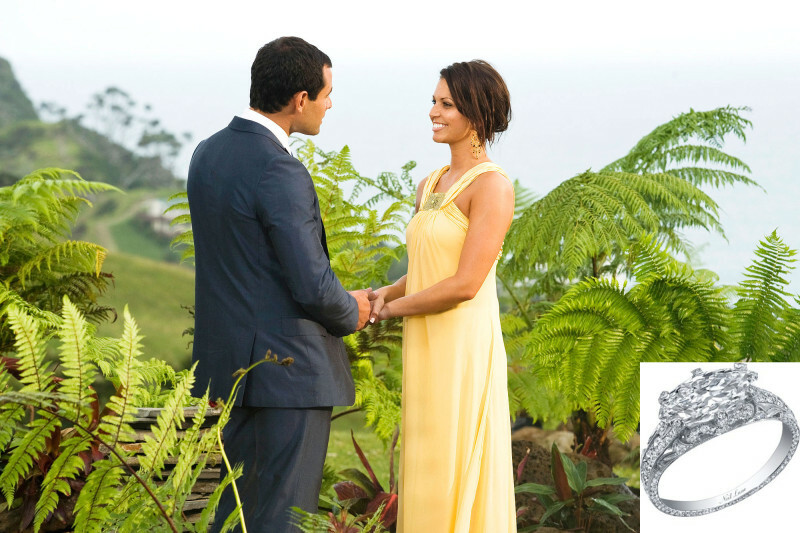 He gave Estella a $45,000 Harry Winston promise ring on season 4 of The Bachelor. I actually really like how small and dainty this ring is. It’s a very nice gesture, even if it isn’t THE gesture. Bob and Estella aren’t together anymore. I wonder if she kept the ring. Lauren Burnham And Arie Luyendyk Jr.
Look who’s back— it’s Arie Luyendyk. This time he’s sure that he’s given the ring to the right woman. It was a rocky ride to happiness, but Arie and Lauren eventually got there. 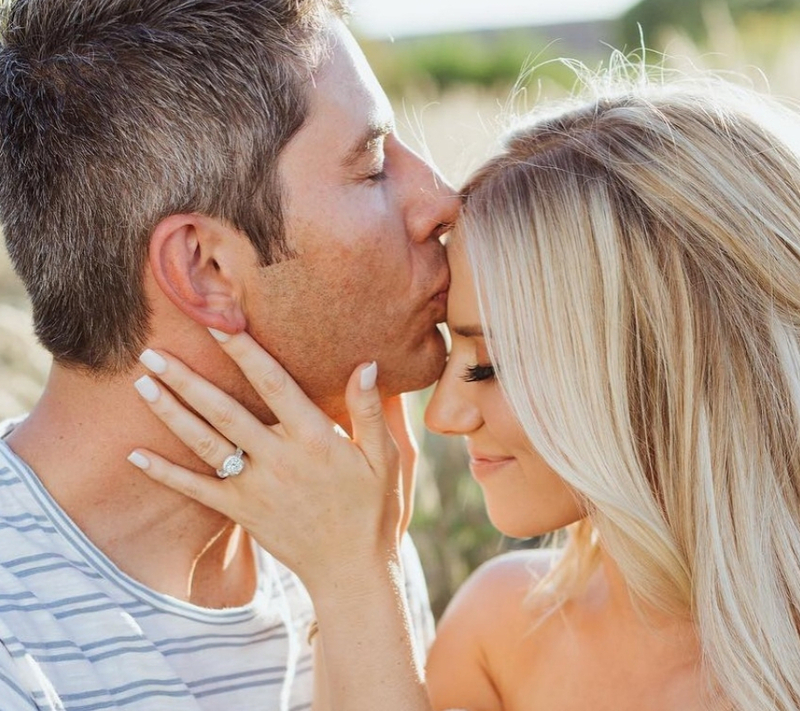 Arie and Lauren are now married, and Lauren is currently pregnant with Arie’s baby. They’re having a girl. Arie proposed to Lauren with a pretty hefty cushion cut diamond surrounded with a whole bunch of other smaller diamonds. Now this is a ring that I can get behind. While it’s not exactly my personal taste, I can still appreciate how unique and well made this ring is. This ring is definitely special. The three centre stones really complement each other, and the intricate white gold band just pulls everything together. This Tacori ring is 3.5 carats. That’s a lot of carats for one person. I hope Mary appreciated it. This ring was also presented to a lady in 2003, but I think it looks a little bit more timeless than Trista’s ring. Sorry, Trista, that ring just doesn’t hold up. Andrew proposed to Jen with a stunning Oval cut diamond on a dainty white gold band. The rings on The Bachelor franchise have definitely gotten more impressive over the years, but it’s nice to see where it all started. Charlie and Sarah weren’t quite ready to take the plunge and get engaged, so Charlie presented Sarah with a promise ring instead of an engagement ring. This is one impressive promise ring, though. It has three diamonds on it and the band is encrusted with even more diamonds. This relationship may not have been built to last, but at least that ring looks pretty sturdy. A promise ring just isn’t as good as the real thing. We’re still looking at the early days of The Bachelor with this ring that Prince Borghese’s mother designed for Lorenzo to give to Jennifer. I don’t know how I’d feel about my future husband’s mother designing a ring for me. I feel like he should have designed it himself instead of outsourcing that job to his mama. I guess his mom is a pretty good designer, though. It does look pretty shiny. 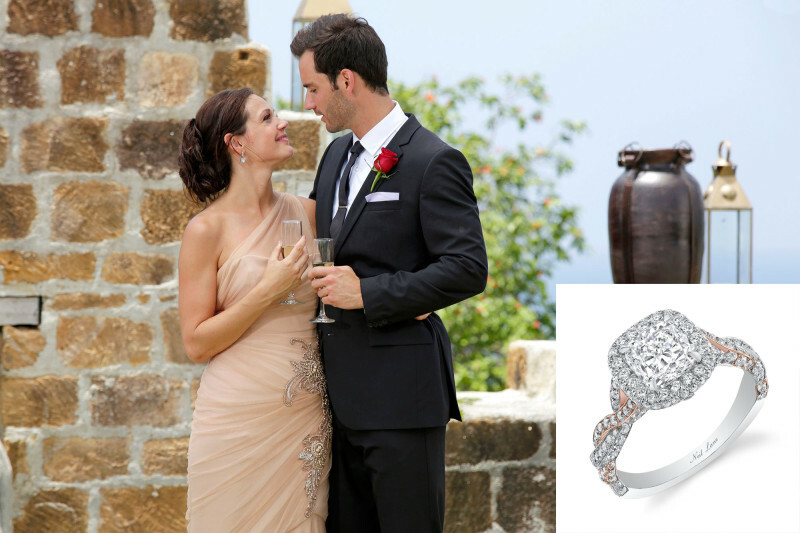 Season 12 of The Bachelor ended with Matt proposing to Shayne with a stunning and very sparkly Tacori ring. This is a classic engagement ring. I don’t think anybody would dislike a ring like this, but it is also very basic. Shayne really liked it though, and that’s what really matters. But then they broke up, as is the case with most Bachelor couples, so I guess it didn’t really matter. I don’t know about you, but I think this is a pretty ugly engagement ring. Maybe I just don’t like square cut diamonds, or maybe I don’t like the way this square cut diamond is sitting on this particular band, but either way, I don’t think I could say yes to this engagement ring. DeAnna liked the ring, though, or at least, that’s what she told Jesse on her season of The Bachelorette. It was during Jason’s season of The Bachelor, season 13, that Neil Lane became the king of all Bachelor engagement rings. Season 13 was also a pretty tumultuous season. Safe to say Neil Lane began his reign as the jeweler of choice starting with Rycroft’s stunning east-west marquis during season 13 of the Bachelor. Jason proposed to Melissa on the season’s finale, but then he changed his mind and broke up with Melissa on After the Final Rose. He ended up marrying his runner up, Molly and now they have 2 children together. Ed proposed to Jillian with a pear-shaped diamond atop many other diamonds of all shapes and sizes. This ring is reportedly worth close to $60,000. Ed and Jillian are no longer together. They got engaged in May 2009, but on July 7, 2010, it was announced that the couple was “taking some time apart to re-evaluate their relationship.” They never did end up walking down the aisle, but at least Jillian got to wear this stunning ring for a little while. 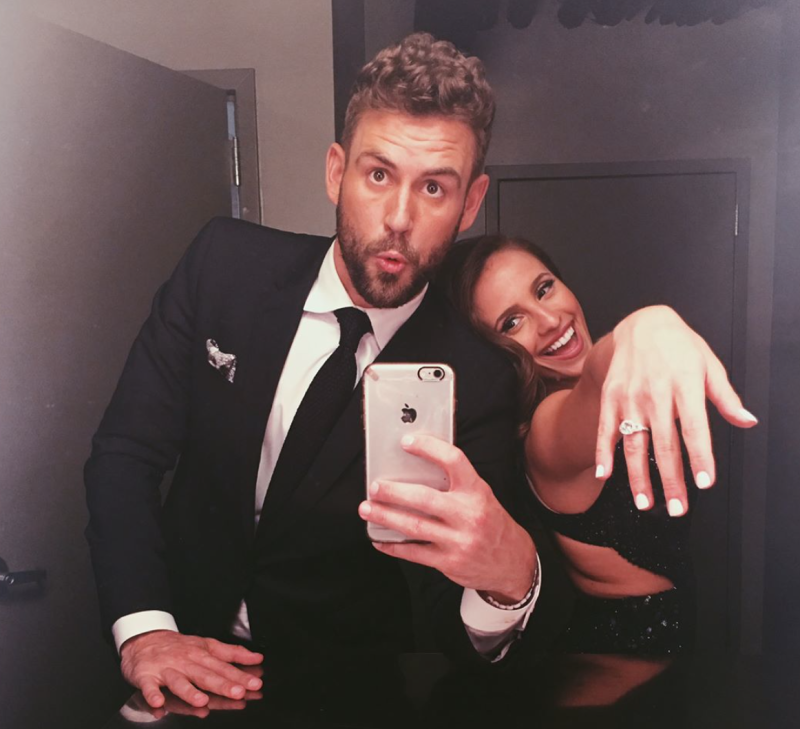 Jake proposed to Vienna on season 14 of The Bachelor with a cushion cut stone with a halo setting on a narrow, white gold band studded with tiny diamonds. This ring came from Neil Lane, of course. Jake and Vienna want through some serious Bachelor drama, and I’m pretty sure Vienna actually threw this ring in his face on television. The Bachelor never guaranteed a happy ending. We live for the drama, though. 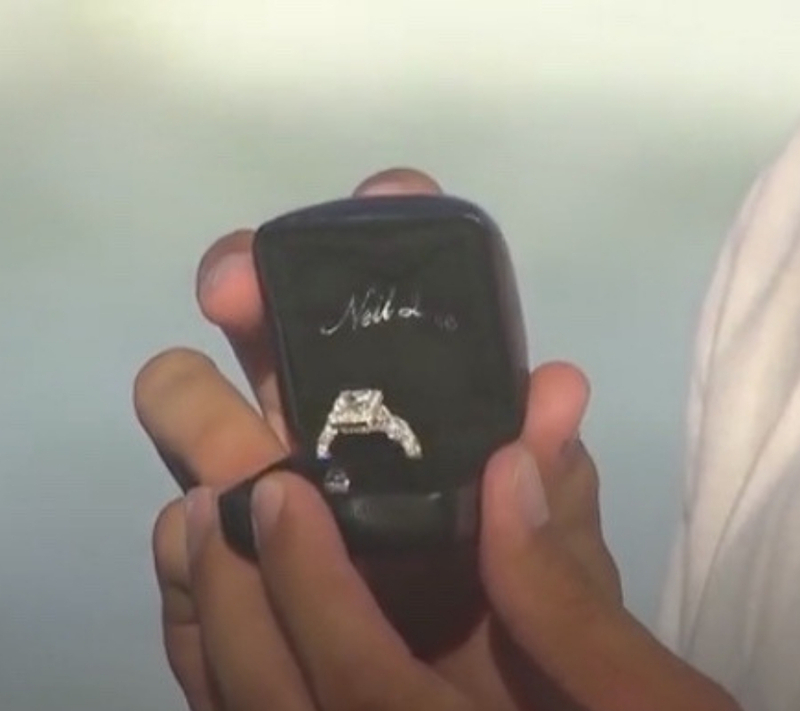 Ali Fedotowsky accepted an Asscher-cut Neil Lane solitaire on a diamond-encrusted white gold band from Roberto Martinez on the finale of season 6 of The Bachelorette. Ali is no longer with Roberto, but she was able to find her own happily ever after. Ali is now married to Kevin Manno and she has two children. She has a daughter named Molly and a son named Riley. Ali got her happy ending after all. 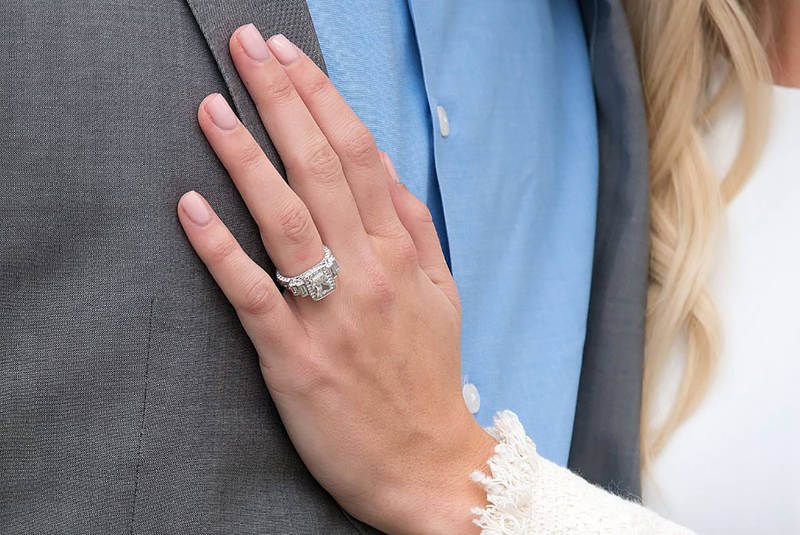 I love the ring that Brad Womack chose for Emily on the season finale of season 15 of The Bachelor. This ring just looks like Emily. I love the split shank design and the halo of diamonds around the centre diamond. As we all know, things didn’t work out so well for Brad and Emily. Keep reading to find out what Emily’s second Bachelor engagement ring looked like. I think it’s a little bit nicer than this one. 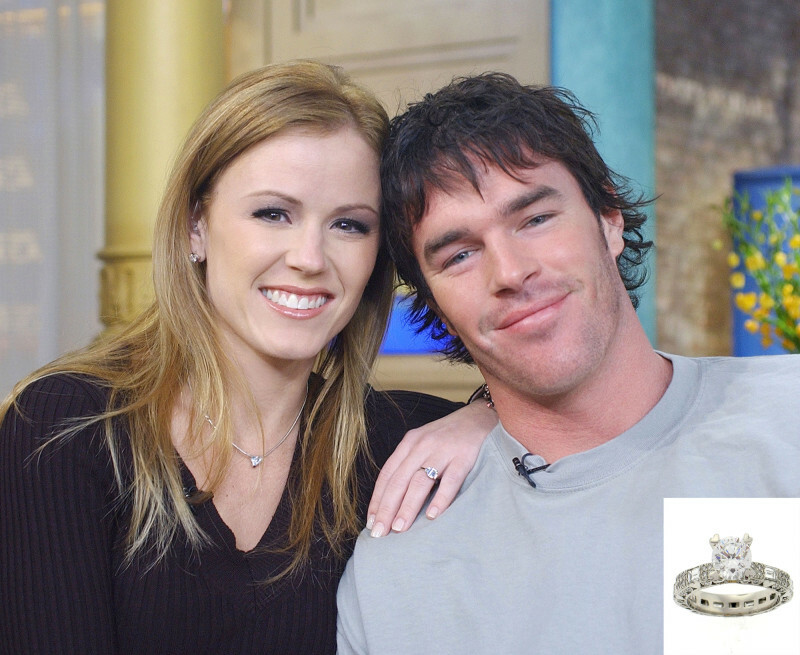 Ashley and J.P. are one of the few Bachelor couples who are still together, and I have to assume that at least some of the success of their relationship is due to this fusion cut stone with a halo setting designed by Neil Lane. Ashley and J.P. got married on December 1, 2012. They now have 2 kids together. These two are living the post-Bachelor dream. I guess it really can work out if you believe in the process. Jade made it to hometowns on the season of The Bachelor that she was in. Tanner didn’t make it very far at all on his season of The Bachelorette, though. These two managed to find love in Paradise and they’ve been together ever since. They’ve become something of a Bachelor in Paradise success story. Tanner proposed to Jade with this horizontal emerald cut diamond. It’s unique, it’s elegant, and it’s perfect for Jade and Tanner’s relationship. Jade and Tanner have a daughter together and Jade is currently pregnant with the couple’s second child. Carly and Evan had one of the most iconic relationship arcs in Bachelor in Paradise— nay Bachelor history. Evan loved Carly but Carly wasn’t sure about Evan. Then Carly and Evan ate some spicy peppers and went to the hospital. Carly eventually fell in love with Evan, and now they have a daughter together. 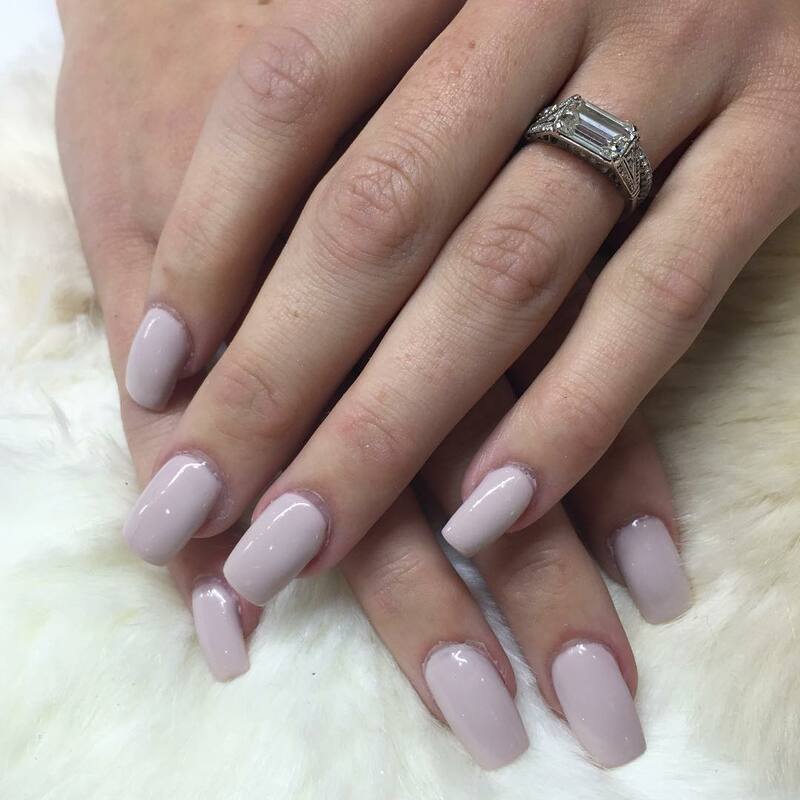 Evan proposed to Carly on the season finale of Bachelor in Paradise with this pear-shaped diamond in a halo setting on a split shank band. Like many Bachelors before him, Ben chose a Neil Lane ring for his final lady. 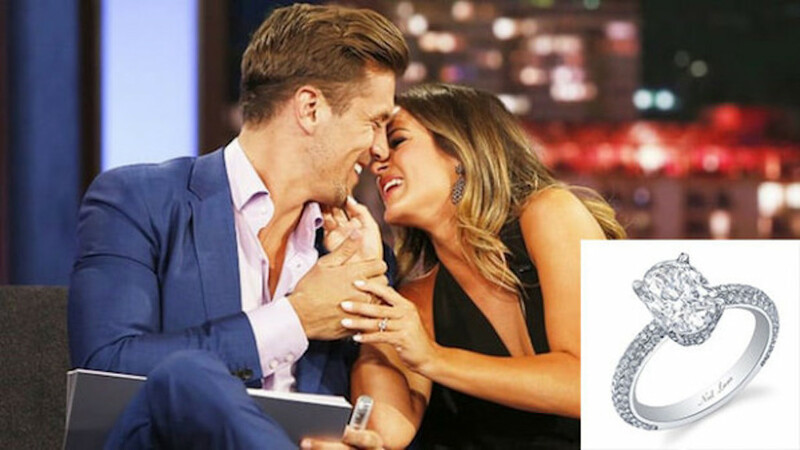 Cushion cut stones also seem to be very popular with The Bachelor cast. This ring has a pretty hefty center stone with a halo of smaller diamonds around it. The band of the ring is also adorned with small diamonds. I think Ben made a good choice. I don’t mind a cushion cut. I know this ring isn’t for me, but I’m still entitled to my opinion. Emily may not have been able to make it work with Brad, but she got a second chance at love when she got to be The Bachelorette on season 8 of the show. Her chosen man, Jef Holm, proposed to her with a 2.5 carat emerald cut diamond in a halo setting by none other than the one and only Neil Lane. I know I said that Emily’s last ring was so "her," but I think this ring is a more elegant, more grown-up version of her. Like very few other Bachelor Couples, Catherine and Sean are actually still together. Sean was a born again virgin when he appeared on the show, but now he’s happily married. Sean and Catherine have two sons together and they’re living a blissful domestic life. Also they’re making a lot of money on Instagram. 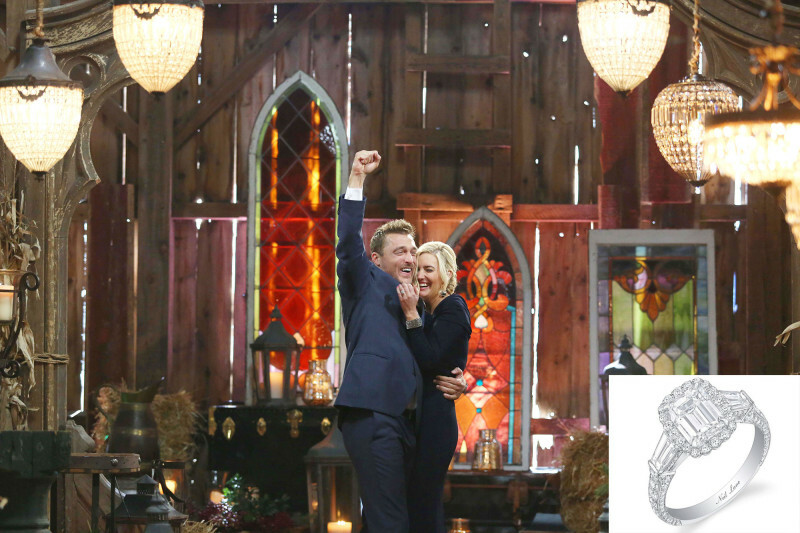 Sean proposed to Catherine on the season 17 finale of The Bachelor with this 3.15 carat cushion cut diamond. The split shanks are very classy. Nice one, Neil Lane. After the man Desiree thought was her first choice decided to leave the show before the finale, Desiree thought she had lost her chance to find love. Then she decided to rethink her relationship with Chris. She realized that Chris was the man for her all along. Now Chris and Desiree are married and they have two children. Chris proposed to Desiree with a cushion cut diamond in a halo setting on a twisted white and rose gold diamond encrusted band. Josh Murray proposed to Andi Dorfman with a $72,000 Neil Lane oval-cut diamond stone in a double halo setting on a platinum band. Andi was all in with Josh when she gave him her final rose, but all of us watching at home were yelling at our television screens. We knew that Josh wasn’t the guy for Andi even if she couldn’t see it yet. Eventually, Andi broke up with Josh, she wrote a tell-all book, Josh went on Bachelor in Paradise and stirred up some drama, and the rest is history. We were pretty sure that Chris was going to pick Whitney on season 19 of The Bachelor. Chris was a pretty awkward bachelor, but he and Whitney seemed to have some chemistry. Chris proposed to Whitney with a 4 carat cushion-cut diamond flanked by two smaller diamonds placed in a horizontal fashion. It’s a unique ring, and Whitney gladly accepted it. After sticking together through Dancing with the Stars, Chris and Whitney decided to call it quits. Ashley Iaconetti spent most of her time on The Bachelor franchise pining after Jared Haibon, the man with a very distinctive jawline who famously “friend-zoned” Ashley. Eventually after much drama and many tears, Jared realized that Ashley really was the girl for him. 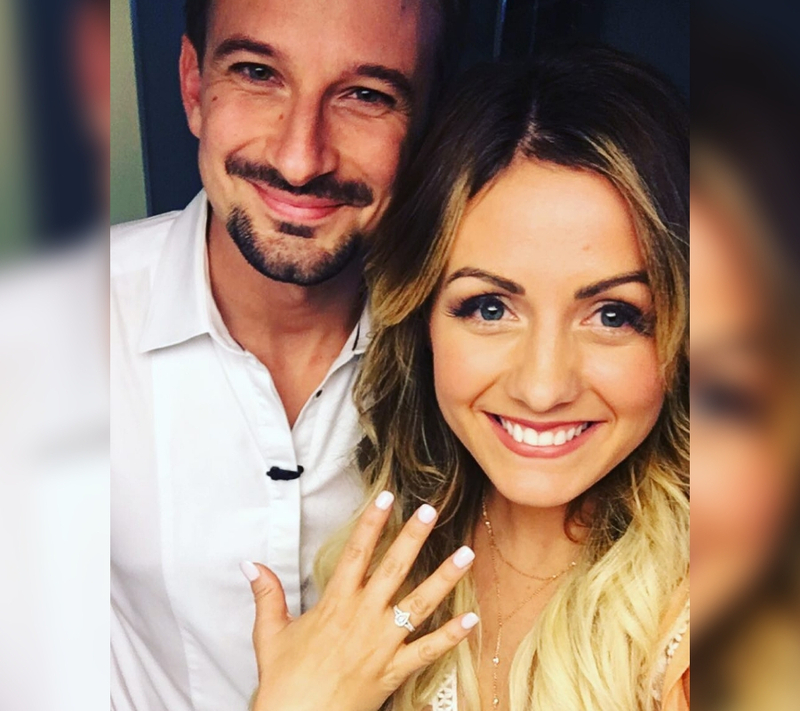 He proposed to her on the third season of Bachelor in Paradise. 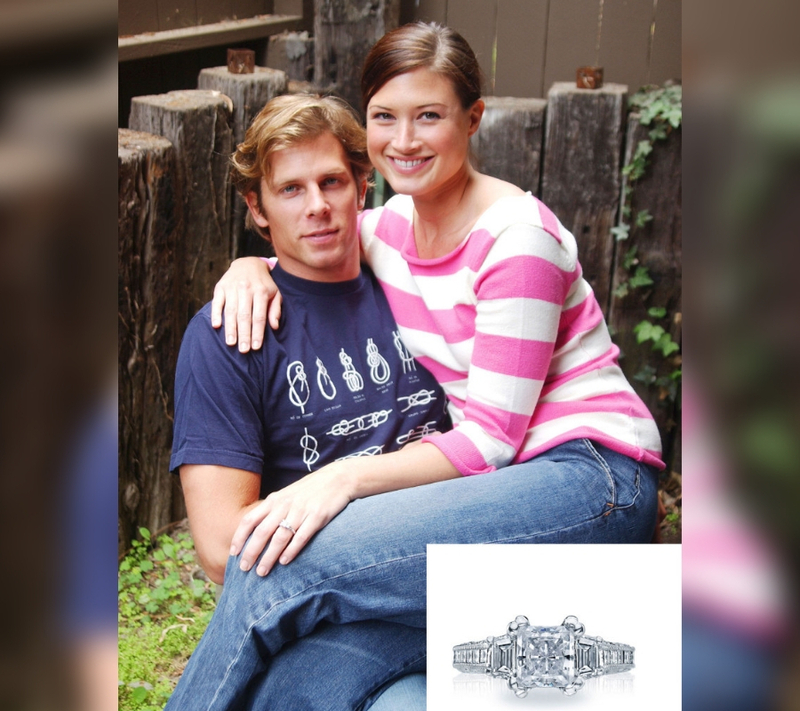 Jared presented Ashley with a cushion cut diamond in a halo setting on a slim, diamond studded band. Sound familiar? I think Kaitlyn Bristowe will go down in history as one of the greatest bachelorettes of all time. Her season was so much fun to watch particularly because of Kaitlyn’s spunky personality. Kaitlyn and Shawn seemed to really be in love, and they stayed together for a long while after the show ended. They never did get married, though. They broke up at the end of 2018. This ring was nice while it lasted, though. Ben Higgins proposed to Lauren Bushnell on the finale of season 20 of The Bachelor with a 4.25 carat Art Deco style engagement ring. The ring is reportedly worth $100,000. While Ben and Lauren looked happy on After the Final Rose, they ultimately broke up and went their separate ways. Ben will always be one of our favorite Bachelor leads, though. He treated all of the women with respect and he made us all fall in love with him. Jordan Rodgers proposed to Jojo Fletcher in Thailand on season 12 of The Bachelorette. He presented her with a 3.5 carat diamond worth close to $85,000. The oval cut diamond was exactly Jojo’s style, and it’s quite different from anything we’ve seen on The Bachelor franchise. Jojo and Jordan are still together. They’ve moved in together and they’re currently planning their wedding. You can catch up with everything they’ve been up to since the show on their shared YouTube channel. No man has been on more seasons of Bachelor shows than Nick Viall. He finally got his happily ever after on his season of The Bachelor— or so he thought. 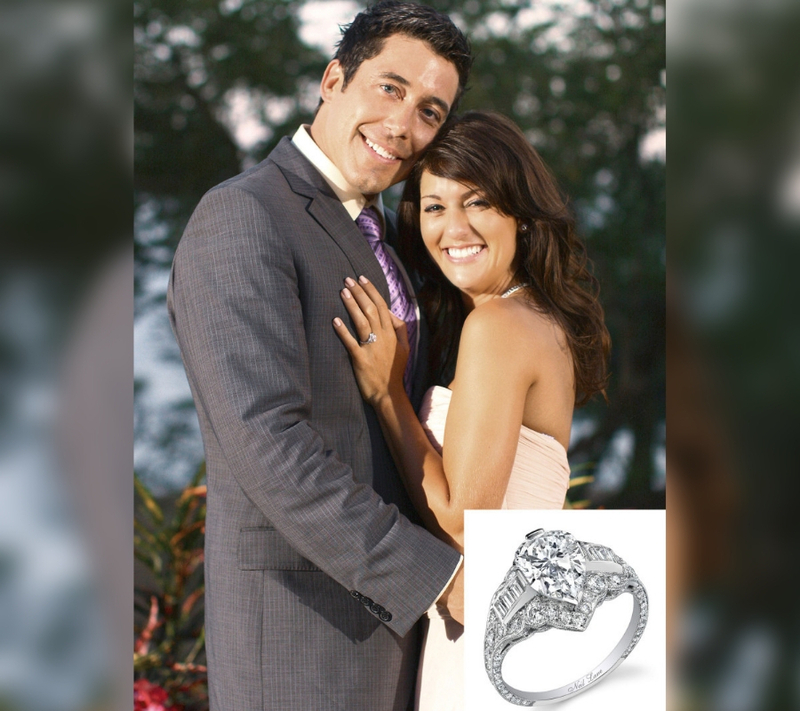 Nick proposed to Vanessa with a round diamond set in a pave-studded platinum band. The ring is supposedly worth $100,000. Nick and Vanessa broke up before they tied the knot, so it looks like Nick is single again. We all saw that one coming. 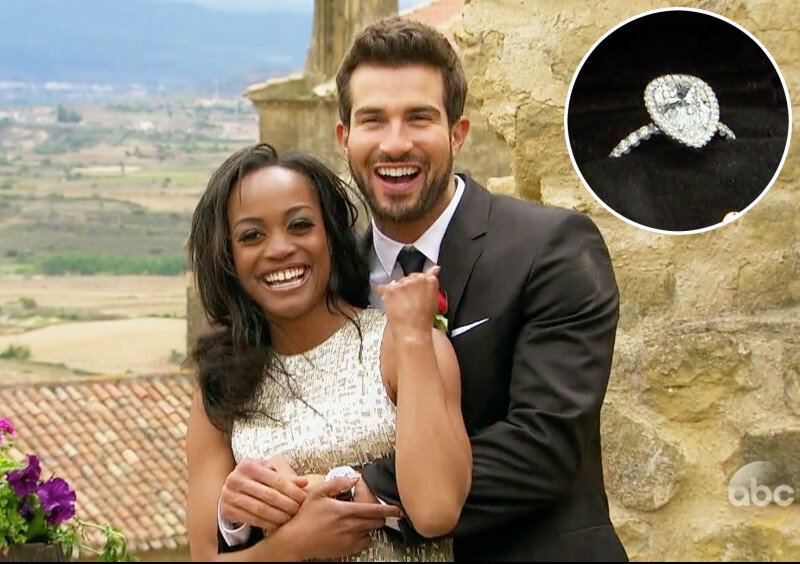 Bryan Abasolo proposed to the Bachelor franchise’s first African American bachelorette with a 3 carat pear shaped ring set in a halo on a platinum band. These two are still going strong, even though we all secretly wanted Rachel to end up with Peter. Peter wasn’t ready to put a ring on it, so Rachel chose to be with Bryan. See how important rings are, people? These two actually seem to be very happy together. Oh Marcus and Lacy, where do we even start? It seemed like Marcus and Lacy were a forever couple on the first season of Bachelor in Paradise. These two got together right away and were inseparable from the very first episode. Marcus proposed on the season finale, Lacy accepted, and they got married on the next season’s premier. But then things went sideways and Lacy and Marcus got “divorced”— although we’re still not sure if that marriage on the beach counts as a real marriage.